Here we are! The big day! 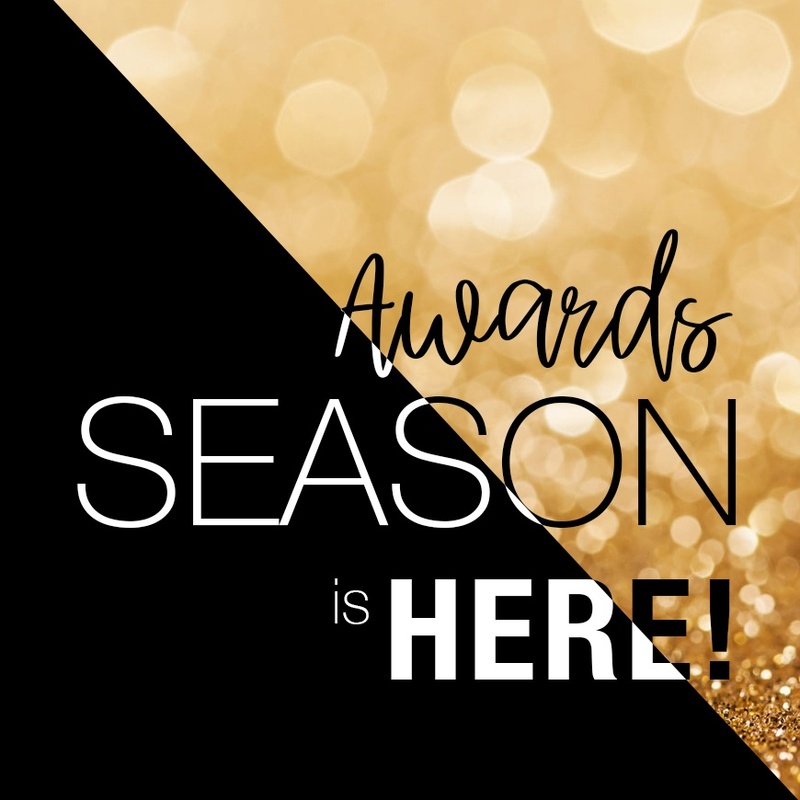 It feels like this awards season has gone on forever and a never ending barrage of controversy from the host, to the length of the telecast, to what awards might not be presented live on the telecast. At the end of the day, the 91st Academy Awards will be a hostless affair and feature only four of the five musical performances. All the winners will be announced live and aside from that many of the races are coming down to a photo finish. As it usually the case, many pundits (myself included) are having last-minute buyers remorse and flip-flopping on who they think the winners will be. 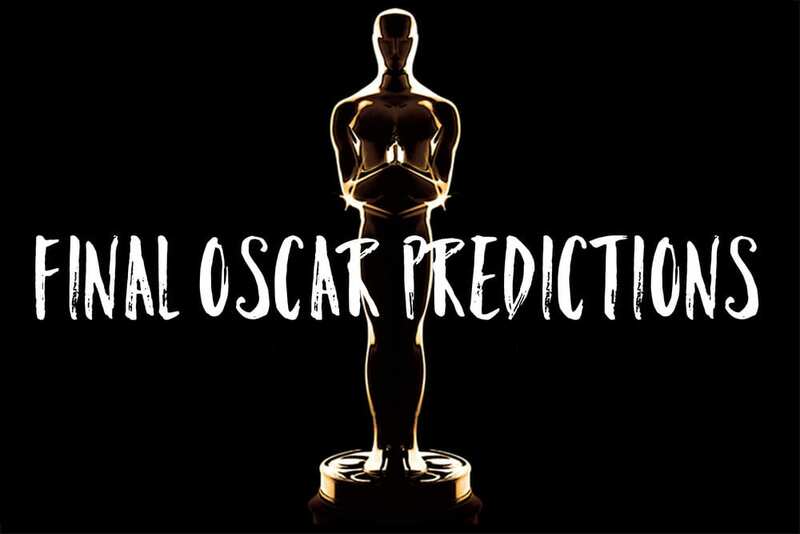 The time has come, however, to shore up my picks and below you’ll see my rankings by film/nominee in each category representing my overall picks as well as a Will Win and Should Win. Hopefully, this will give me a little room to put out into the ether some last minute good vibes for nominees that may not be coming into the night as favorites but who could leave the ceremony with an Oscar in hand. 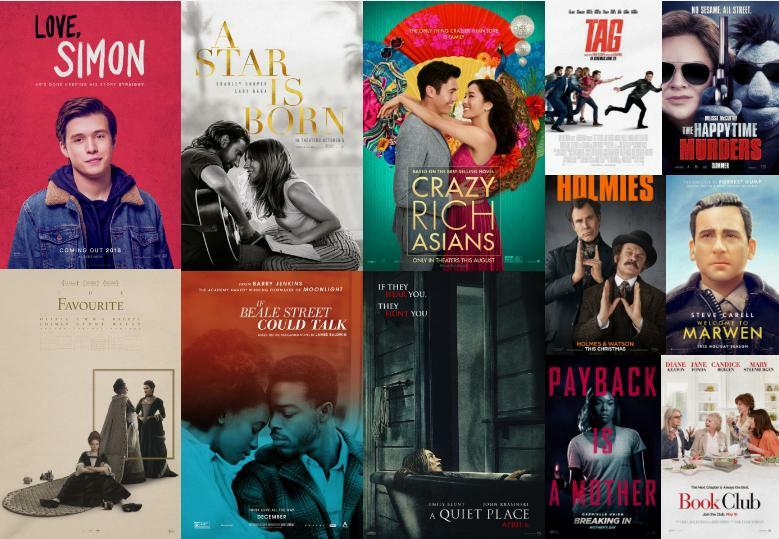 Also, this is the first year I’ve seen all the nominees and while I’m not sure how much of a edge that gets me because the Oscars are nothing if not unpredictable when it comes down to it. I do think, though, that critics/movie fans worth their salt need to look beyond commercial films or buzzed about titles and seek out the nominees that might not be the most talked about. It felt good to see everything and go into the night understanding what the winners were up against. Will Win: All signs point to Roma becoming the first foreign language film to win the Best Picture Oscar. Should Win: My heart hurts that the raw energy of A Star is Born and the audacious pluck of The Favourite won’t be rewarded. Will Win: Alfonso Cuaron’s winning for Roma seems like a foregone conclusion. Should Win: Spike Lee – I just feel deep down this award was meant for him this year. Will Win: Rami Malek – a strong performance but it’s not near the level of work that the person I think should win put in. Malek has played the game this season, though, and when he wins it will be because he gladhanded his way into voters hearts. Should Win: Bradley Cooper – I just can’t believe Cooper didn’t walk away with this award. He was responsible for so much behind the scenes with A Star is Born and then to turn in this kind of performance? It’s remarkable. I do think his lack of presence with voters hurt him — he likely thought he had it in the bag and didn’t put the same kind of effort that Malek did. Which is too bad because the award should be given to the performance, not the person. Will Win: Glenn Close – it’s not, um, close, to her finest work but it’s definitely her time to take home Oscar gold. Should Win: Melissa McCarthy gave the best performance of any of the nominees. No question. Will Win: It’s category fraud since he’s without question the co-lead of Green Book, but Mahershala Ali is heading for his second Oscar. Should Win: If there’s one wish I had for Oscar night it would be that Rami Malek would be blanked for Best Actor. If had two wishes, the second would go toward hoping Richard E. Grant would be a surprise upset in this race. Will Win: Regina King is such a strong force in If Beale Street Could Talk and she’s well liked by nearly everyone in The Academy. I found the performance to be slightly one-note but the note is almost always played in perfect pitch. Should Win: Rachel Weisz – though she’ll split the vote with her co-star, Weisz has the trickiest role of the other two ladies in The Favourite. Seeing the movie again recently only confirmed that she’s the MVP of that movie. Will Win: Seems like people want to reward John Ottman for taking the mess that was Bohemian Rhapsody and fashioning it into something that could be released. Still, if you’ve seen the film you’d know that the editing is amateur hour all the way. Should Win: BlacKkKlansman has so little excess fat on it, it’s streamlined which adds to its breathlessness. Will Win: This is a close race with many wanting to reward Paul Schrader, even if First Reformed isn’t in the same league as his classic scripts for Taxi Driver or Raging Bull. I’m still betting on The Favourite to win. Should Win: The Favourite – it’s the best shot it has at a sure-thing Oscar tonight, despite tying Roma for the most nominations. Will Win: The team from BlacKkKlansman are the likely victors, only because this might be the only time of the night to give Spike Lee an Oscar. Should Win: If you’ve read Lee Israel’s book that Can You Ever Forgive Me? was based off, I’m told you’d know why Nicole Holofcener and Jeff Whitty deserve the award for taking source material and expanding its ideas for the screen. Just look what they did with Richard E. Grant’s character who only briefly turns up in the book but becomes a solid supporting player in the movie. Will Win: Roma – the groundswell for this makes it almost an unstoppable force. Only Cold War (the worst of the five) could upset it should voters not want to vote for Roma here and in Best Picture. Should Win: Capernaum – far more involving from a narrative perspective than Roma ever was, I can see why some people are turned off at the subject matter. It’s still the best of the five nominees. Should Win: Robbie Ryan’s cinematography for The Favourite was, like the film, inventive and unexpected. Will Win: The team behind The Favourite created a period-perfect world that was meticulous and gorgeous. Will Win: Ruth E. Carter – every other nominee had some sort of point of reference to work with but Carter created these stupendous designs from scratch using new technologies. That should absolutely get her the Oscar. Will Win: Free Solo – even if the subject wasn’t such a fascinating guy, the effort that went into making this was Herculean in scope. Will Win: Spider-Man: Into the Spider-Verse – no other nominee comes close. Will Win: Avengers: Infinity War – the sheer magnitude of effects is impressive, and that is doesn’t look like a cartoon is why it should be rewarded. Should Win: First Man – the subtle work that went into sending Neil Armstrong to the moon doesn’t overshadow the action and mostly goes unnoticed. The best visual effects are the ones that we believe to be true. Will Win: Vice – Christan Bale’s performance would be just the glorified impression it is without the work here. Should Win: Border – if more people had been able to see this movie, they would be on board for voting. The full body transformation accomplished here was stunning. Will Win: Nicholas Britell’s score for If Beale Street Could Talk was almost another character. It’s beautiful. Should Win: “Shallow”- If this doesn’t win it would be the capper on the cruel journey A Star is Born has gone on these last few months of coming into the awards season as the frontrunner only to be usurped by movies that aren’t nearly as universally liked. 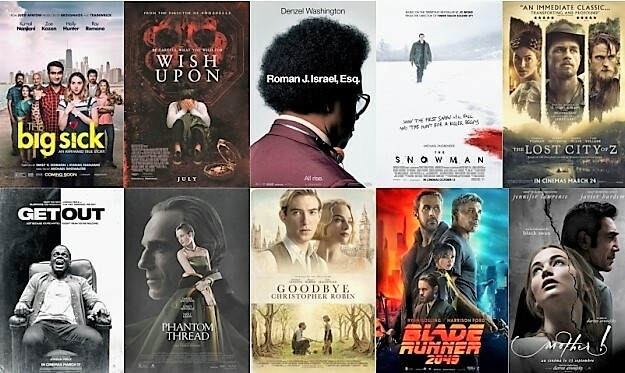 Will Win: Black Sheep – this was a rough bunch this year and this was probably the best of the four fairly depressing entries. I don’t think it’s a true documentary, though, which put it out of the running in my book. Should Win: Period. End of Sentence – I guess I’m just favoring work this year that uplifts and this documentary has its heart in the right place and put it to good use. I can’t believe some of the comments I’ve read about how male voters will likely be turned off because talking about women’s mestrual cycles was “icky”. Will Win: Bao – shown in front of Incredibles 2 this summer, it’s the one most voters will have seen, even if it’s not the strongest of the bunch…or even one of the better Pixar shorts. Should Win: Late Afternoon – the animation may be simplistic but the journey it takes you on is anything but. It’s the clear winner for me. Will Win: Skin – it’s the most cinematic of all but voters knowing the director went on to make a full length film with the same title loosely based on the same subject might want to hold their vote to see how that one turns out. Should Win: Marguerite – the least problematic of all the nominees and also the least outright depressing. Like the animated short Late Afternoon, it’s a small, simple tale beautifully told. The MN Movie Man has been on holiday for the last few weeks but with the Golden Globes announcing their nominees he’s come out of hibernation — stay tuned for new reviews and awards chatter starting next week! In the meantime, check out the nominees for the Globes and the Film Independent Spirit Awards right here. 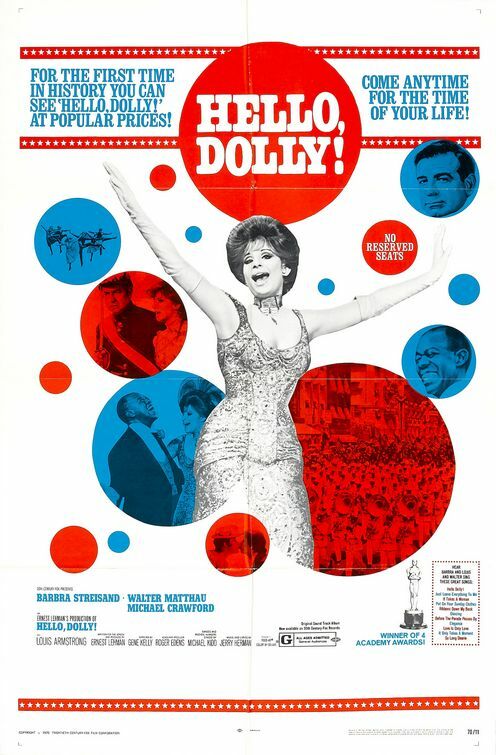 Hollywood to Broadway – Hello, Dolly! Your old pal The MN Movie Man took some time away from dark movie theaters in May for a long overdue visit to The Big Apple and caught up with what Broadway has to offer. Theaters in NYC and London’s West End are continually being filled with stage adaptations of movie properties and out of the 10 shows I saw, half of them either began as a film or are revivals of shows that generated a movie version of their own. In this short series, I’ll go through these five musicals from the Great White Way and see how they compare to their Silver Screen counterparts. When Hello, Dolly! first ambled into town it had built in elegance. 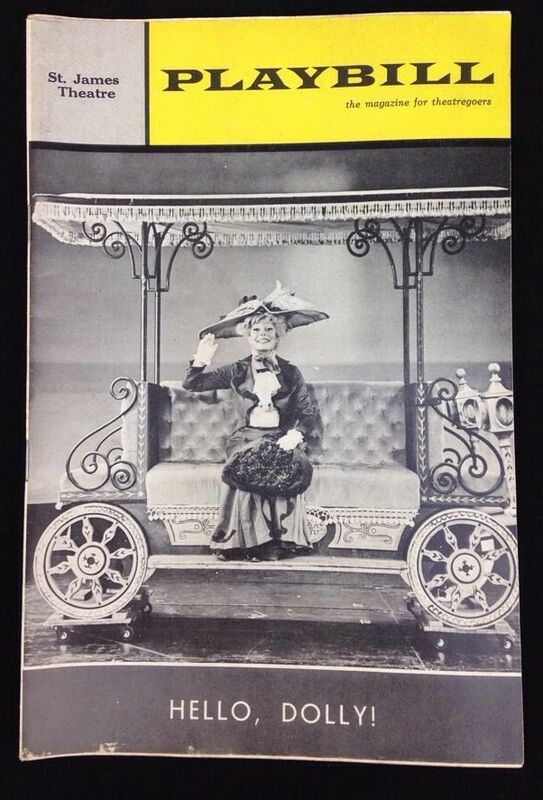 Produced by legendary theater impresario David Merrick, directed by famed choreographer Gower Champion, and starring Broadway favorite Carol Channing, the musical was traditional as they come and played like gangbusters winning 10 Tony Awards and remaining on the Great White Way for a record setting run. Well known for its stunt-casting after Channing left, famous Dollys included stars like Ethel Merman, Ginger Rogers, Betty Grable, and Phyllis Diller, not to mention an ingenious staging of an all-black cast led by Pearl Bailey. Hello, Dolly! also had a healthy life on the road with Channing touring as Dolly for years (decades, really), occasionally stopping back in NYC for limited engagements. Strangely, the first exposure I had to the show wasn’t from a Carol Channing tour but Sally Struthers who performed the role in a local community theater production. 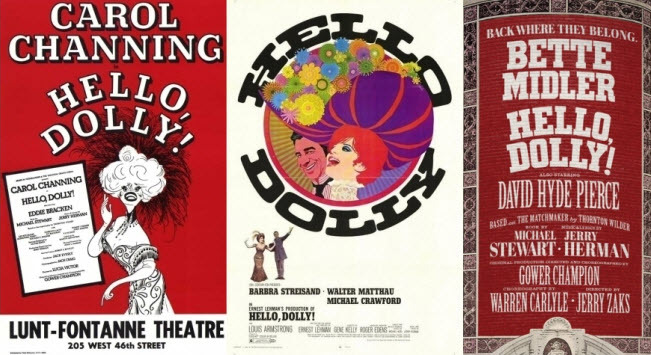 Four years into the Broadway run, 20th Century Fox released a film version of Hello, Dolly! and poor Carol Channing once again got the short end of the Broadway-to-Hollywood stick. Channing was famously passed over for Marilyn Monroe when Gentlemen Prefer Blondes made the silver screen leap and this time around none other than Barbra Streisand got her part. This might have been some sweet revenge for Streisand who lost the Tony Award for Funny Girl to Channing in Hello, Dolly! – it’s well known that Channing and Streisand used to lunch regularly when both were treading the boards but Streisand stopped talking to Channing soon after she was bested by Carol. Actually, maybe Channing had the last laugh since the film version of Hello, Dolly! was a fairly enormous flop when it opened…almost ruining 20th Century Fox in the process. Miraculously, it was nominated for 7 Oscars (including Best Picture!) and won three but the film hasn’t aged well over the years. However opulent the production and costume design were, if the musical itself was by the numbers oatmeal the film is dry melba toast. It’s worth watching for the complete disdain co-star Walter Matthau has for his leading lady…even when he’s supposed to be falling in love with her. 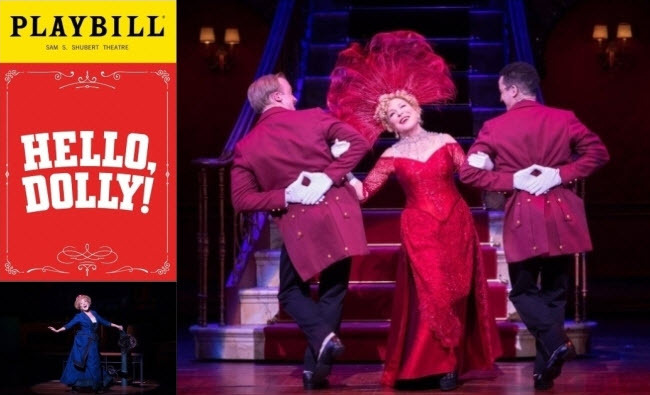 Endlessly produced by theaters big and small across the world, Hello Dolly! still hadn’t had a Channing-less revival on Broadway until it was announced the Bette Midler had agreed to return to NYC in her first musical in over four decades. Naturally, the theater community erupted with delight and the show’s advance soared to a record-setting $40 million dollars. In fact, the show is so sold out that Midler isn’t even doing any press for it. There’s no need…no one can get a ticket without paying a huge chunk of cash or waiting in line for a limited amount of standing room seats given out each morning. That’s how I lucked out at seeing the show on my recent trip to The Big Apple. Getting in line with my friend around 4:30 in the morning, we weren’t even the first in line but had no trouble getting a ticket when the box office opened at 10:00am. Already having opened to glowing reviews, I knew this would be a memorable experience and it truly was. It’s hard to express the pure joy this production elicits…it’s just something you pretty much have to see for yourself. Midler was in fabulous form, nailing the comedy and nuance of the role and doing a darn good job singing Jerry Herman’s score along the way. While she’s a bona fide superstar and everyone there was there to see her, she never upstaged her co-stars…all of whom are the cherry-picked best of the best. From David Hyde Piece’s droll but sincere Horace to Kate Baldwin’s gorgeous Irene, the voices are beautiful and the ensemble is sharp and crisp. Special mention must be made for Beanie Feldstein (Jonah Hill’s younger sister) who makes for a hysterical Minnie Fay. With Midler scheduled to remain in the show for a year, ticket demand may free up as newer shows populate the landscape but be prepared for this to remain a tough ticket for some time. The production itself is designed to run after Midler leaves…it just needs a star of her caliber to bring in the audiences. With uber-producer Scott Rudin running things, expect some stunt casting to rival original producer David Merrick’s in the A-list department. 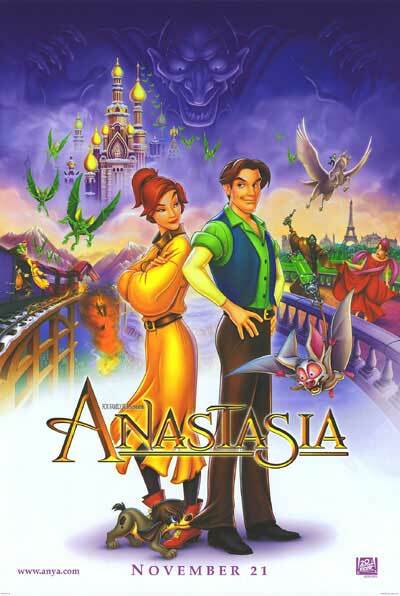 Yes, yes, I know that there was a version of Anastasia from 1956 that netted star Ingrid Bergman a Best Actress Oscar but since the Broadway version was inspired/adapted from the 1997 animated movie let’s focus on that one instead. Of all the non-Disney animated films that started popping up in the mid to late ‘90s, there was something about 20th Century Fox’s Anastasia that hit the right chord. Hard to believe that a pretty grim plotline involving the family of a Russian Czar being murdered and a mystery girl that could be the lone surviving heir became the basis for a fancifcul musical romp, former Disney animator Don Bluth was riding a nice wave of second banana popularity and managed to massage this one into a family affair. Digging into the supernatural for its villain Rasputin, it wasn’t to be taken very seriously but it surely seemed to remain a fond favorite of a lot of little girls over the years. Honestly, it’s never been a particular favorite of mine, though full disclosure I’m writing this review from memory instead of recent exposure, but I do remember the handful of songs from Broadway composers Lynn Ahrens and Stephen Flaherty being a definite highlight. Nabbing two Oscar nominations for their work, Ahrens and Flaherty would get their chance at a full blown musical version of Anastasia twenty years later but would the adults that were pre-teens in 1997 shell out Broadway prices to bring their children to see Anastasia live again live onstage? From the screaming crowds and squeals of delight emanating from the Broadhurst Theatre in NYC, the answer is a resounding ‘Yes’. I have to say, though, that the entire affair was completely lost on me and I’m debating whether it was just fatigue from doing standing room for my 7th show in five days or if I simply didn’t care for the piece in general. Make no mistake, it’s got a lovely cast led by the beautiful and genuine Christy Altomare and two swoon-ready leads in Derek Klena and Ramin Karimloo (the only actor to receive rapturous entrance applause) but there’s something fairly vacant about it all. Director Darko Tresnjak, scenic designer Alexander Dodge, and projection designer Aaron Rhyne work wonders with making sense out of swiftly changing scenes by nimbly moving the action around St. Petersburg and Paris and Linda Cho’s costumes are downright stunning. Yet for all the gloss and glam the material feels kind of ham-fisted and the new music from Ahrens and Flaherty, while orchestrated grandly, never actually soars. The best music is still the two most popular songs from the movie, ‘Once Upon a December’ and ‘A Rumor in St. Petersburg’. Aside from a more than capable set of leads, there’s dynamite supporting work by theater grande dame Mary Beth Peil (Tony nominated here) and a riotous Caroline O’Connor as her mischievous lady in waiting. Whenever those two are onstage the musical snaps to life but with too many ballads and songs that sound the same it’s enough to lull even the most alert tourist into a gentle slumber…I actually dozed off a few times and I was standing up! 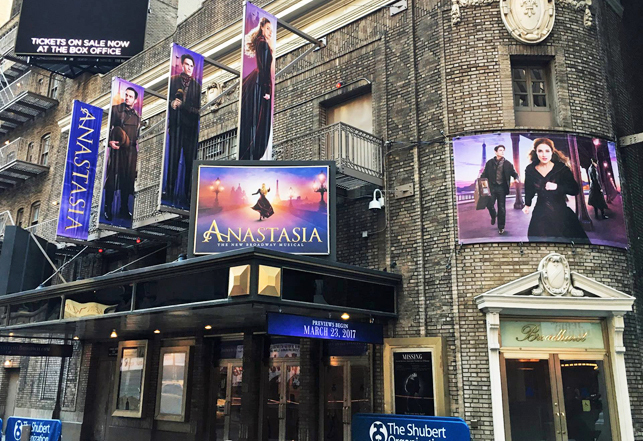 Already doing great box office numbers and with productions announced around the world, Anastasia will be coming to your neck of the words eventually and I think the design elements would travel quite well. 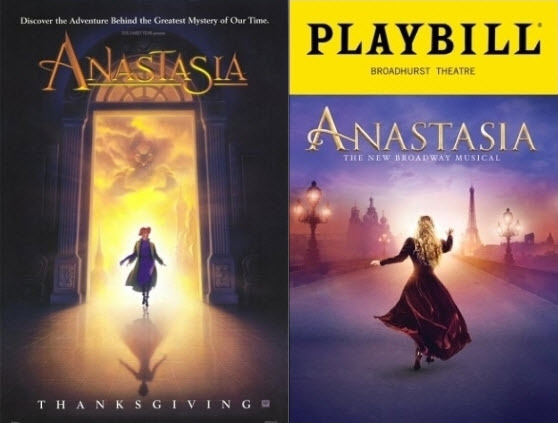 Here’s hoping the tour gets tweaked a bit to take the air out of some of the scenes and one or two songs get the heave ho to keep the mystery at the heart of Anastasia something we actually want to get to the bottom of. As usual, I find myself confessing some deep dark movie sins on this blog and here’s another one to add to the list. Ok…here we go. Promise you’ll still like me after? No turning back now… Until recently, I wasn’t a fan of Groundhog Day. Good…thank you for sticking around. Y’see, I think Groundhog Day was originally sold to 13 year old me as the kind of comedy that would have me rolling in the aisles at Bill Murray’s crazy antics as a cranky weatherman that falls into a vortex of having to repeat the same day in an endless loop. The trouble was, the comedy ran deeper than surface gags and one-liners and there was a sadness to it all that I just didn’t understand at that time. Coming back to it as an adult, I found the film to be a real delight with a dynamic craftsmanship most modern conceptual comedies could only dream of. As Phil Connors, Murray is in top form as the over-it-all newscaster seemingly slumming it reporting from Philadelphia on whether good ‘ole Punxsutawney Phil will see his shadow and foretell six more weeks of winter. Waking up the next day with an eerie sense of déjà vu, Phil eventually realizes he’s stuck re-living the same day over and over and over and over and over again with no way to break the cycle. Along the way he becomes an expert piano player and learns French. Eventually he tests the limits of his “power” and experiments with what life would be like as a jerk or as a nice guy, finally overcoming his mythological torture when he gets things right. Murray had good support from Andie MacDowell who feels like a good straight man to Murray’s particular type of comedy…and who can forget Stephen Tobolowsky’s nebbish Ned? 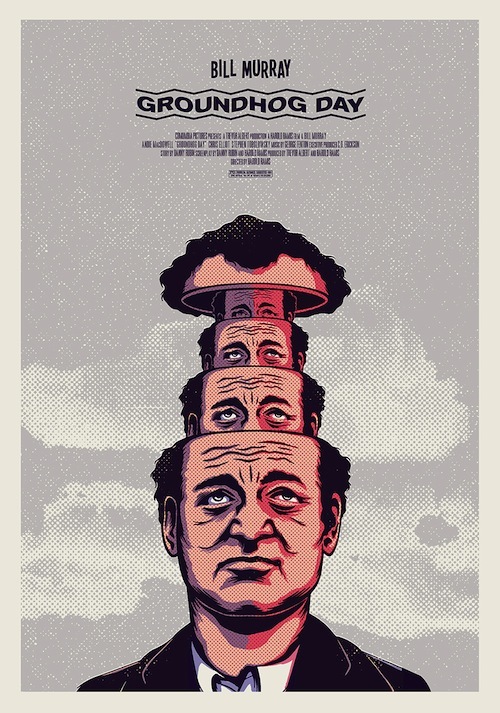 Directed by Murray’s frequent collaborator, the late Harold Ramis, Groundhog Day is one of those near perfect comedic treats that works across multiple age-groups, even if the humor was lost on me as a teen. 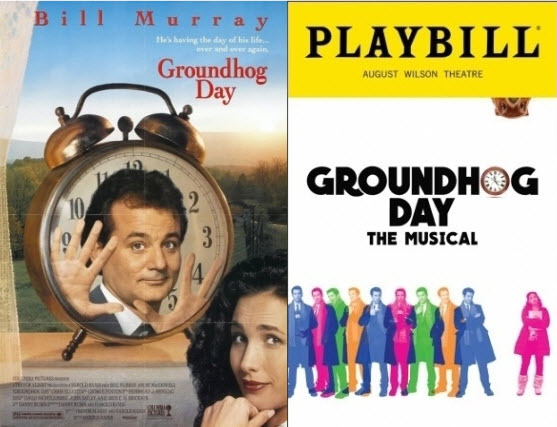 Unbelievable as it sounds, the one and only Stephen Sondheim was the first composer who showed an interest in bringing Groundhog Day to the stage but by the time the musical premiered at The Old Vic in London last year, the composer was Tim Minchin. Minchin is a well-known Australian comedian that found success back in 2010 with his adaptation of Matilda. Having recently seen Matilda, I knew that Minchin favored tricky lyrics and music that wasn’t always hummable…but that Down Under style of comedy seemed like a great fit with Groundhog Day’s structure and it turns out I was right. While I literally couldn’t relay a bar of music I heard in Groundhog Day if you paid me $10K, the show was constructed so well and performed so effortlessly that I have to give great credit to the creative time that saw this one through to the finish line. It’s fascinating to me that a show so American would have its successful world premiere in London (it won the Olivier Award for Best Musical) but perhaps producers thought if they could be a hit in the UK then a US run would be a slam dunk. 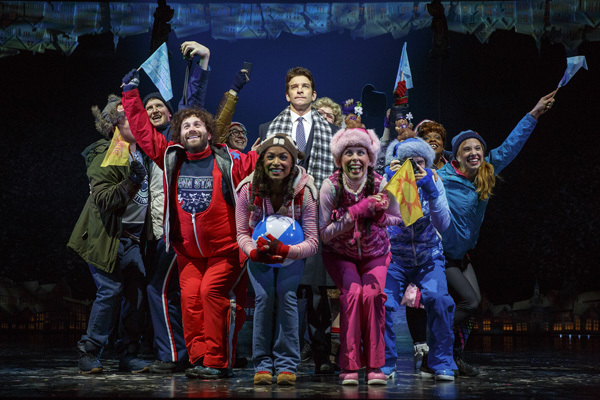 Nominated for 7 Tony Awards, Groundhog Day started performances at the tail end of a solid year of new musicals so it faces an uphill battle on Tony night for most of the categories it’s nominated in. One category up for grabs , though, is Best Actor and while I haven’t seen star Andy Karl’s biggest competition (Ben Platt in Dear Evan Hanson), Karl is downright beloved in the Broadway community and would surely deserve the honor. Coming back from a potentially sidelining injury during previews is sure to garner more goodwill (if not an outright sympathy vote) but what Karl’s doing onstage is pretty exemplary work. Phil is one of those classic musical characters we shouldn’t be rooting for but wind up cheering on and that’s thanks almost entirely to Karl’s genuine performance as a man that turns a corner after reaching multiple dead ends. Minchin’s music and lyrics blend nicely with Danny Rubin’s faithful adaptation of his screenplay, only making minor adjustments that translate better to the stage. Karl’s co-stars are all solid, though a song for a local babe that opens Act 2 feels extraneous. Kudos also to the director and choreographer for making some enjoyable sleight of hand stage magic to get Karl back to the beginning of his day in increasingly creative ways. Though it’s housed in the beautiful August Wilson Theater with its quaint (read: too small!) seats, this feels like a show that might work better on tour in Middle America. I’m not sure the entire production with its multiple turntables and high tech LED displays would easily transition to a bus and truck road show and it does need a star performance to anchor the evening…but if it comes to your neck of the woods give it a shot. Check out my look at Sunset Boulevard! Check out my look at Charlie and the Chocolate Factory! You don’t get more Hollywood than Billy Wilder’s Sunset Boulevard. Released in 1950, the movie was a scathing bite at the Tinsel Town hand that fed the majority of the people involved. Nowadays there’s nothing Hollywood loves more than patting itself on the back and showering movies about the film industry with plaudits (hello, La La Land!) 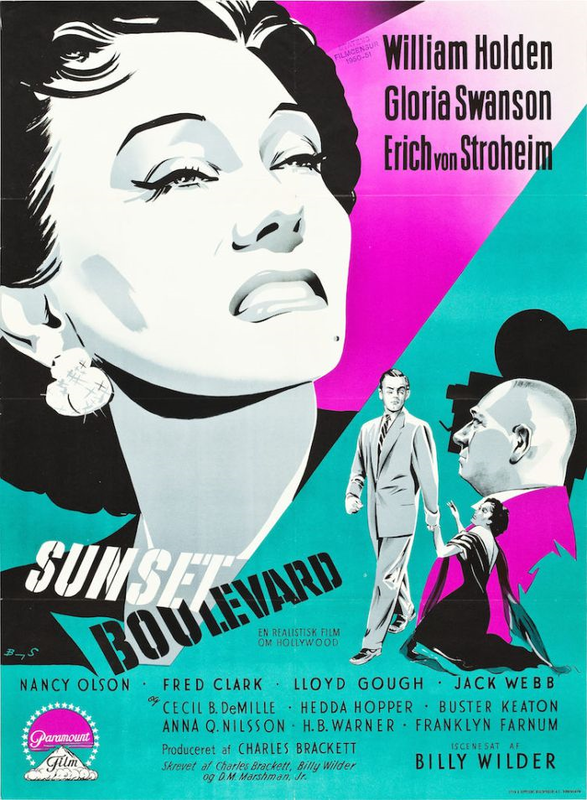 but back when Sunset Boulevard arrived not many industry people were immediately lining up to sing its praises as an insider’s look into the studio system. Nominated for 11 Oscars including Best Picture, Director, Actor, Actress, Supporting Actor, and Supporting Actress, the movie was up against some stiff competition (All About Eve, Born Yesterday, Father of the Bride) and wound up winning just three: Art Direction, Screenplay, and Franz Waxman justly took home gold for his haunting score. Even if over the years Gloria Swanson’s unhinged fading silent film star would be fodder for parody from the likes of Carol Burnett, the picture remains oddly timely and still a strikingly beautiful film. Filled with unforgettable moments such as Swanson’s creepy crawl toward the screen as it fades to black, it’s an unqualified classic that earns its place as one of Hollywood’s crown jewels of filmmaking. It’s also a pleasure to see legends such as Cecil B. DeMille, Hedda Hopper, and Buster Keaton play themselves, further blurring the line between reality and fiction. I was barely a teenager in 1993 when Andrew Lloyd Webber’s musical adaptation of Sunset Boulevard premiered in London. I’m not even going to go into its troubled path behind the scenes involving lawsuits from two divas (Patti LuPone & Faye Dunaway) who were both hired and fired before the show even premiered stateside. When the musical arrived in NYC in 1994 it easily won a host of Tony Awards including, among others, Best Musical, Best Actress for Glenn Close, and another for its gargantuan set designed by John Napier. The sheer size of the production was legendary but made it difficult to recoup its investment so it didn’t wind up being the true smash it could have been. Even a touring production folded quickly due to the constraints of such a behemoth making the move from theater to theater on a weekly basis. Subsequent productions scaled back the proceedings (one even had its actors playing their own instruments…shudder!) 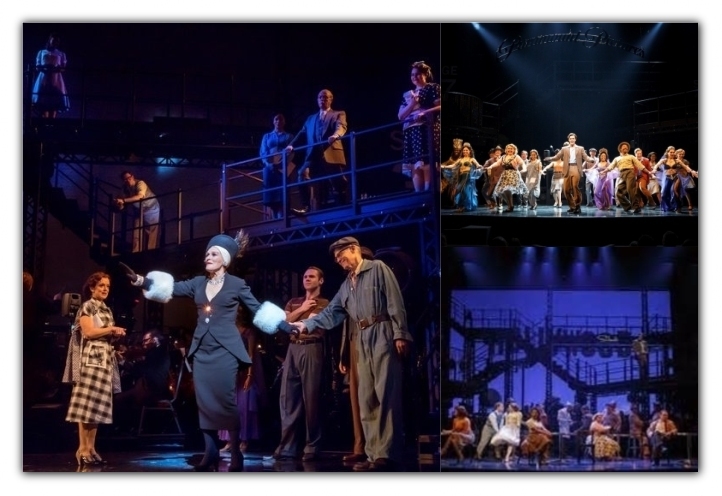 but it wasn’t until 2016 when a semi-stage run in London with Close reprising her role that there was talk Broadway might get another trip down Sunset Boulevard. I’ll admit the chief reason I planned my trip to NYC was for the chance to see Close in the role she will forever be identified with (at least onstage). Seeing Close, um, up close was too good of an opportunity to pass up and add to that a 40 piece orchestra in Broadway’s famed Palace Theatre and the writing was on the wall…I had to see it. There’s no way to accurately describe the experience of seeing Sunset Boulevard the way I think it was meant to be seen, with its original leading lady and a grand orchestra in a scaled back production smartly restaged by director Lonny Price that may have been smaller set-wise but felt grandly operatic all the same. Removing the lavish set dressings allowed the music (some of it borrowed from Waxman’s original score) and the performances to be the justified stars of the show. Handsome Brit Michael Xavier sports a spot-on American accent and handily takes on doomed screenwriter Joe Gillis while Swede Fred Johanson is imposing but loyal as Max, Norma’s chauffer – both men sing wonderfully. Price has assembled a well-oiled ensemble including one that plays a ghostly visage of a young Norma Desmond that haunts her elder self throughout the evening. The show is all about Close, though, and she’s unforgettable. She already made for a thrilling Norma in 1994 (at least on CD) but seeing her take on the same role over 20 years later was revelatory. The voice isn’t always rock solid but these moments of grated fragility only add to the overall sadness of the character. From her first entrance to the goosebump-inducing finale, it’s impossible to look at anyone but Close because she’s always completely ‘in’ the scene even during the very few times where she’s not the focus. 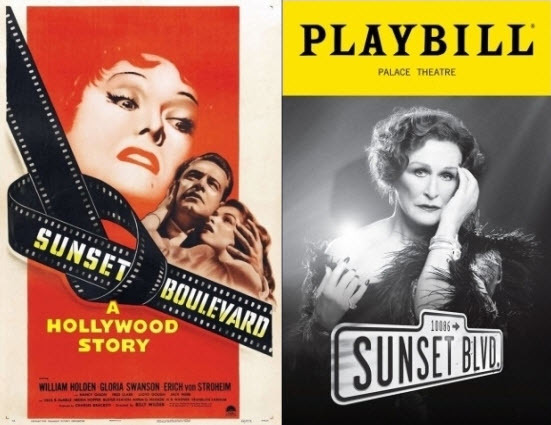 Gloria Swanson and Glenn Close will both be remembered for their interpretations of Norma Desmond, and while Close’s original reading was just adjacent to Swanson’s screen performance in this revival she goes deeper and recreates the role from the ground up. It was everything I wanted and more – well worth the trip!